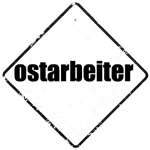 Ostarbeiter was a Death Industrial project of Olegh Kolyada, dating back to summer 1998. During 1999-2001 the band released several tapes & CDRs under different titles. «The Iron Era» 2CD edition is a collection of material recorded at the turn of the millennium. The industrialist document also includes four collaborations with Deutsch Nepal, Wertham, Isomer, and Streicher. Originally planned to be released via French rip-offs Slaughter in Art in 2010, this memorial recording was selected by Steinklang Industries and co-released with Old Captain in May 2012.